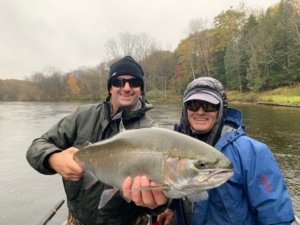 The Muskegon river fishing report for October 31, 2018 is about the fall steelhead run !….and ghost and goblins on this edition of Halloween 2018 ! The last couple weeks+ have seen the river go from good water levels and a lot of fall Chinook salmon on their annual spawning run in the river, to the tail end of the salmon run, onset of the fall steelhead season, but with river conditions that were low and VERY clear up and down the entire river system. John holds a beast of a Muskegon river fall steelhead that blessed us with 11 jumps, some of them over 5′ high, before coming to the net ! 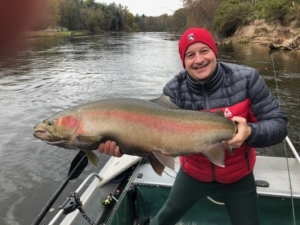 With next to no measurable precipitation in the middle and upper reaches of the Muskegon river watershed for nearly 3 weeks, the fall steelhead fishing was good for only a couple days in the middle of the month, but we’ve had a trickle affect of new fish entering the river since then. Click HERE for current weather information. The rains that came through much of west Michigan yesterday afternoon and evening didn’t really dump much water in the mid and upper sections of the river, which is where we need to see it, in order to affect flows from the Newaygo area down to Muskegon itself. Click HERE for current river conditions. 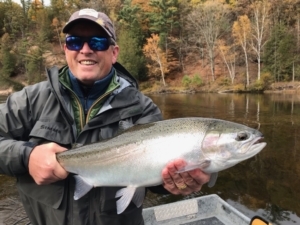 Jud is a part of the group that came to fish for a couple days and got the largest steelhead he may EVER catch, while he and another member of the group fished on guide friend Aarons boat……what a slob of a fish ! All that said, there are some quite large steelhead around, with a number of them over 15# already caught up to this point. With both fly fishing and light spin tackle equipment, I will be scouring all stretches of the river in the weeks ahead, as we’ll be chasing “fall chrome” up to Christmas. Present water temperature is hovering around the 50 degree mark.